Electrospinning is a very attractive method for preparing polymer or composite nanofibers. Electrospun nanofibers with a high surface area-to-volume ratio have received much attention because of their biomedical applications. Recently, the incorporation of metal nanoparticles into polymer nanofibers has drawn a great deal of attention because these metal nanoparticles can endow the polymer nanofibers with distinctive properties, such as optical, electronic, catalytic, and antimicrobial properties. These properties enable nanofibers to be used in variety of novel applications such as biosensors, catalysts, nanoelectronic devices, etc. 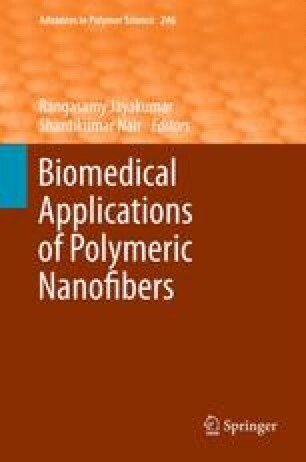 Nanofibers containing silver nanoparticles have a wide range of application potential such as for filtration, wound dressings, tissue engineering, biosensors, and catalysts. This review summarizes the preparation and applications of silver nanoparticles incorporated into polymeric nanofibers. One of the authors, R. Jayakumar, is grateful to SERC Division, Department of Science and Technology (DST), India, for providing the fund under the scheme of “Fast Track Scheme for Young Investigators” (Ref. No. SR/FT/CS-005/2008). S.V. Nair is grateful to DST, India, which partially supported this work, under a center grant of the Nanoscience and Nanotechnology Initiative program monitored by C.N.R. Rao. R. Jayakumar is also grateful to the Department of Biotechnology (DBT), Govt. of India for providing research support.